The difference between when a story explodes in the media and the time it actually happens, can be two totally different things. Just ask Bill Cosby. Such is the case with the sexual abuse scandal in the Catholic Archdiocese of Boston. On January 6, 2002 the Boston Globe ran the first of many reports detailing a shocking pattern of molestation and cover-ups that had been going on for years. The ignominy went deeper than the actual acts. It was also that the Church knew about the crimes and knowingly shuttled priests to different parishes when incidents would rise. The events in the Archdiocese had local repercussions. Cardinal Bernard Law ultimately resigned as the Archbishop of Boston for his administrative role in the crime. However what originally appeared to be a problem within the local diocese caused other victims to come forward in parishes across the United States. The sheer number of people attested to a pattern that went back decades. The ensuing scandal spread and became a nationwide crisis for the Catholic Church. First and foremost, Spotlight is about investigative journalism. The story itself is secondary to the way reporters conduct their procedure. The narrative is fashioned as a finely tuned ensemble piece. It’s fascinating that an entire film can be constructed simply out of conversations. But rest assured, these are extremely eye opening discussions. Liev Schreiber is the newly appointed Editor-in-Chief, Marty Baron, presented as a Jewish outsider in the largely Roman Catholic enclave of Boston. At first the exposé appears to be about John J. Geoghan, one former priest found to have a history of abuse, but Marty suspects a systemic problem. Before they publish, he presses the team to dig deeper. Was the hierarchy of the Boston diocese aware of this misconduct? Editor Baron pays a courtesy call to Cardinal Law (Len Cariou). Their chat highlights a happily upbeat Law, who mistakenly assumes the Boston Globe will work WITH the Catholic Church. At the heart of Spotlight is the investigative unit. Michael Keaton, Mark Ruffalo, Rachel McAdams, and Brian d’Arcy James portray the core reporters of the team. As Assistant Managing Editor Ben Bradlee Jr., John Slattery oversees them. Spotlight certainly puts the Catholic Church on notice for the way it handled the allegations, but it also has a harsh critique for journalists themselves, even the very ones who finally broke the story. Interestingly, all of the the “Spotlight” reporters admit to being lapsed Catholics. Despite having fallen from organized religion, their lack of desire to offend their readership underlies their hesitancy at first. The way news stories are buried and ignored, sometimes for years, is a very key point of the drama. The information was always there. It just wasn’t reported properly. Lawyers (played by Stanley Tucci and Billy Crudup) are on opposite sides that have represented the plaintiffs and defendants for years. They each have extensive knowledge of the cases and are key to understanding the depth of this problem. 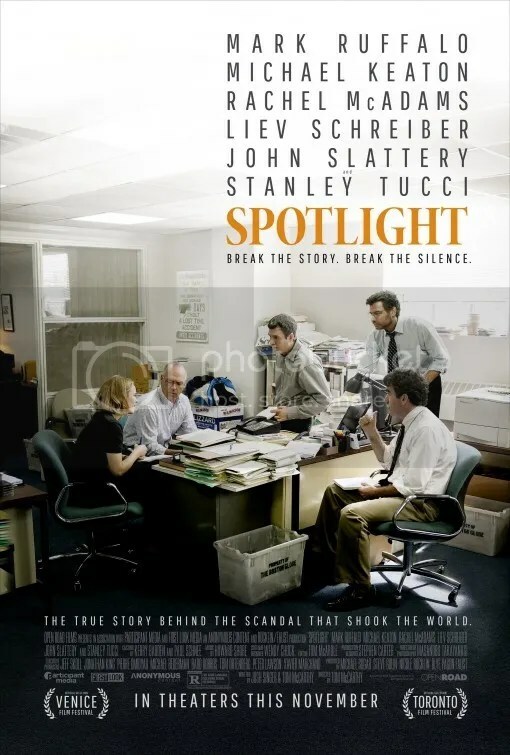 Spotlight is a pragmatic and clear headed approach to investigative journalism. Director Tom McCarthy (The Station Agent, The Visitor, Win Win) and his co-writer Josh Singer (TV’s The West Wing) do not sensationalize the subject. For example, there are no flashback scenes of the abuse. Discussions with the now adult victims are carefully handled as fact finding interviews. At one point, a man only offers he was “molested” as a boy. Rachel McAdams as reporter Sacha Pfeiffer, gracefully presses that he needs to be more specific as that word can have a variety of meanings to different people. Our witness to the rest of their conversation ends there. In a later scene, Sacha knocks on the door of another former clergy member: Father Ronald H. Paquin (Richard O’Rourke). Their brief, matter-of-fact interaction is one of the most memorable dialogues in the entire film. It stays with you because it reveals so much in mere mommets. The trust we place in trusted figures of authority, the role of journalists to report the news, the way scandals affect our faith, the lasting effects of sexual abuse – Spotlight touches on all of these issues and more in a 128 minute runtime that flies by. It does all this in the guise of a straightforward drama. The account could have been about almost any report, as long as it were true. The nature of this story obviously gives the chronicle an emotional component, but Spotlight is somewhat dispassionate. Yet that weakness of sorts is also its strength. The drama is efficient, objective and direct and that’s exactly what good news journalism should be. This entry was posted on November 12, 2015 at 2:27 pm and is filed under Biography, Drama, History with tags 2015. You can follow any responses to this entry through the RSS 2.0 feed. You can leave a response, or trackback from your own site. Fascinating. This sounds like the bigger, older and wiser brother to ‘Truth.’ A film that so totally should have been better than what it was — great performances aside — because it was too tempted to sensationalize the moments. And as you say here, Spotlight doesn’t do that so I’d be really interested in making comparisons with these films just on that basis. I know they have little else in common other than being rather high-profile stories about investigative journalism. There’s been some buzz surrounding Cate Blanchett’s performance. However, she’s also in Carol and she’s fantastic in that. Oscar rules forbid an actor to be nominated more than once in the same category. Therefore the studios must pick one to promote. I haven’t seen Truth, but trust me. Carol is her best shot. Exactly. Truth was all about feeling IMPORTANT, whereas Spotlight was simply important. The latter was much better done. That is surprising. I wonder if those people will regret their decision when this gets nominated for Best Picture. I doubt it.. you know those Catholics..they just forgive themselves and move on.. ha! ha! I don’t believe in religion so I’m not even sure what that means!! Given the highly volatile subject, the narrative was surprisingly restrained. hi mark. am wondering if you have seen “the paper” directed by ron howard? I haven’t but when I first saw that Michael Keaton was in Spotlight, that’s the picture I immediately thought of. you might enjoy “the paper”, but its different from Spotlight. The Paper is more of entertainment than informative. but i did see Spotlight yesterday and thought it was great. nice review mark. As someone who was raised Catholic and went to Catholic school from kindergarten through high school, I was also shocked by the scandal. Like you, I was very impressed with the balance Spotlight brought to covering faith and to the entire story itself. It treats everyone as equal players the cover up of this abuse and doesn’t paint the journalists as superheroes, which I love. I agree that the conversations in the film are eye opening and it’s a finely tuned ensemble piece. You sum up the piece well with your description of the drama being efficient, objective, and direct. It’s what good journalism is all about. Personally I was also fond of this picture for its portrayal of Boston. As someone who lives in the city, I think Spotlight does a fantastic job of capturing the city’s mindset, culture, and geography in ways that other films (like Black Mass) do not. I would have never noticed the location similarity that unites Black Mass and Spotlight. That’s an interesting observation. Should watch this with other 2015 Boston movies like Infinitely Polar Bear and Ted 2. Fantastic review! Really enjoyed reading this, since its one of my most favourite movies ever.